The practice of lawyers investing in clients’ businesses is current and growing. Past experience with this type of activity (which includes taking equity positions in the form of shares of stock) has taught us that this practice raises significant issues which need to be managed. 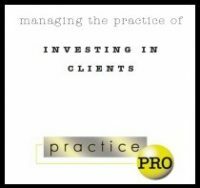 This booklet (Download PDF) will explain the issues you should consider before engaging in the practice of investing in clients.